Best blender that will last! I bought a Blendtec blender and I love it! I am very pleased what I am able to do with this high quality blender. When the blender came in the mail, I tried smoothie after smoothie after smoothie. My poor family... they had smoothies coming out their ears! I absolutely love it! My two young sons know whenever they hear the blender, they come running for a tasty treat. Yum! I use it at least 3 times a day. And not just for smoothies. I make my own nut milks, dairy-free cream soups, waffle batter, sugar-free fruit sorbets, and actually healthy shakes! Just to show you the power of this blender, check out the video below! Just imagine being able to make creamy nut milk shakes that competes with any of the unhealthier versions that are available at most restaurants. They contain tons of vitamins and minerals that nourish the body with no refined sugars, dairy, or chemicals that you can't pronounce. Unlike other high-end blenders, the Blendtec does not require an extra canister to grind hard grains such as wheat and oats. Just imagine... You can make your own salsa with a push of a button or enjoy ice cream with your children without feeling guilty. This blender allows me to create so many recipes from scratch that it saves me a lot of money and time. Not only would you be saving money, but you would also be able to make healthier options for your family! 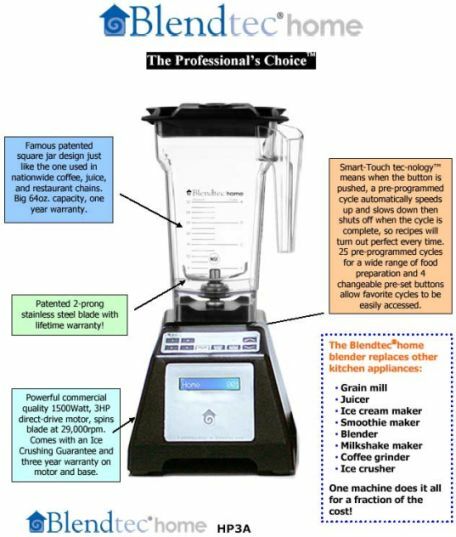 Here are some questions for you to find the best blender for you and your family. Have a Blendtec? Write a review on what you think!